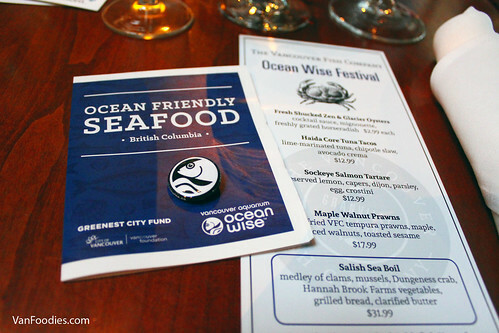 November is Ocean Wise Month, and to celebrate sustainable seafood in the area, Vancouver Aquarium hosted the Ocean Wise Chowder Chowdown last week. Lucky for me, I got to check it out, so let me tell you all about it. How does it work? 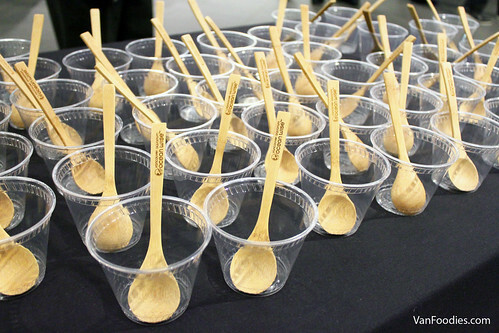 As you enter the Vancouver Aquarium, you receive a wooden spoon and a plastic cup; and you just walk around with them to the 14 participating booths. You also have a ballot to take notes of each chowder and vote for your favourite. 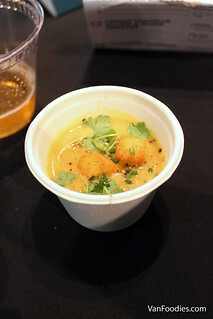 Each of the 14 competing chowders was paired with craft beer. I was quite impressed to see that there were restaurants from Prince Rupert and Pemberton competing in this event. 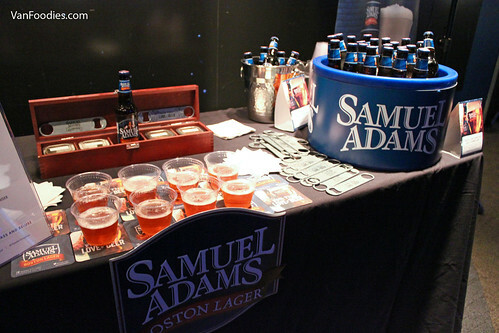 Among the participating craft breweries, there was Samuel Adams, the only non-local craft brewery at the event. It partnered with Fable and Chef Trevor Bird not only in the beer pairing, but it’s also used in cooking of the halibut chowder. SA’s Boston Lager is darker than most lagers out there (has an amber-ish hue), yet it’s light and quite easy drinking; would be a good entry beer for most people and would make great pairing with rich food like a chowder or deep-fried goodness. Have you heard? Yew Restaurant + Bar has set up a pop-up shop at Holt Renfrew for a month. Running til April 12, Yew at Holts carries sandwiches, salads and desserts for you to pick up on-the-go. The other day, my coworker TC and I stopped by and picked up a few things to bring back to the office. The menu is pretty straightforward, 3 sandwiches, 3 salads and 5 desserts. Sandwiches and salads are $10 each, desserts are $4 each, taxes are already included. 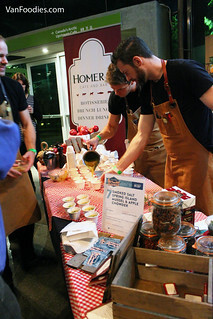 In addition to the traditional prix fixe menu offered by restaurants in Vancouver, the Dine Out Vancouver organizer also put together a number of culinary events, including the popular Street Food City. Returning for its second year, a dozen or so food trucks gathered at the Vancouver Art Gallery, allowing food truck enthusiasts to experience street food all in one spot! So I made it over to the Vancouver Art Gallery with my colleagues. Of the list of participating food trucks, some I have already tried, some I’m not particularly interested in. I had my eyes set on the Kaboom Box and that’s exactly where I headed. Some food carts had a special DOV creation on their menu, not for the Kaboom Box. Of its regular menu, I was choosing between the Hot Smoked Salmon Sandwich and the Venison Burger. In the end, I ordered the Hot Smoked Salmon Sandwich because it claims to be “world famous” and appears to be the most popular menu item. I received an invitation to a sit-down media dinner at C Restaurant, to sample its Dine Out menu. I said yes without a blink. C Restaurant and I go way back. 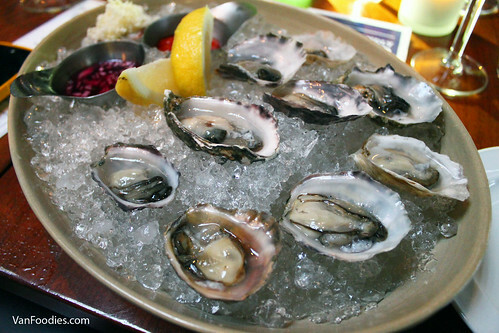 In fact, it all started with a DOV dinner back in 2004, when the menu was – hold your breath – only $25. That was before my photo-taking/food-blogging time, but I remember it was a very enjoyable dinner, especially for the value of it. Then, I went back for another DOV dinner in 2008, and the price already went up to $35, nonetheless a wonderful meal. In 2011, I visited C again for one of its tasting menus, courtesy of deal coupon discounts; it was a different experience because the dishes were smaller in portion and I could tell that the culinary direction had changed since my 2008 visit (sorry, was in hiatus mode so there wasn’t a post on this). This media invite has piqued my interest in trying the now more upscale C Restaurant, at an affordable $38 DOV price. Keep in mind that this is a media event so it may not necessarily reflect the true quality of food, but this should serve as a good indication of what you should expect from this restaurant. And I won’t be commenting on its service quality because it’s hard for me to judge when we were considered the “VIPs”. I must start by saying that C’s DOV 2012 menu includes four courses. Actually, it’s amuse bouche + 4 courses, so by the sound of it, it’s already a better deal than other $38 restaurants. The only down side is that there’s no option for each course. Well, there is, but at extra cost. On the positive side, the menu is more focused since chefs and cooks are making same dishes, so they should have better control on quality assurance and consistency. Shall we begin? The Amuse Bouche were presented beautifully on skewers. On the menu it lists smoked cannelloni as the only item, but I was watching other diners and they seemed to have received a variety of skewers like we did. It probably depends on the number of people at each table. Because there was not enough for everyone to try everything, I only tried three of the five items. They were simple, one-bite skewers that whet your appetite for the meal ahead. The first course is Pickled Beet Panzanella Salad. Panzanella is a dressed salad of greens and stale bread. It’s basic, but in this case the beets and harissa dressing brought a lot of flavour to the dish. Beets were sweet, and a bit sour from the pickling, and the harissa dressing added a tiny kick and was probably the highlight of this dish for me.